When shopping around for a crossover near Mechanicstown there are choices other than Honda, but we’re not quite sure why, after looking at all the facts, customers would choose anyone else. The 2013 Honda Crosstour, available now at Middletown Honda, is the automaker’s latest entry into the crossover market after dominating it significantly with the founder of the crossover: the CR-V. The Crosstour offers drivers a different take while still committing to that level of crossover success established by the CR-V.
To prove the point, though, let’s see how the Crosstour stacks up to a competitor like the 2013 Subaru Outback. To start with, in this age of rising gas prices, the new Honda crossover offers an improved efficiency over the Subaru. Drivers of the 2013 Honda Crosstour 2WD EX with automatic transmission will enjoy EPA-estimated* city and highway fuel economies of 22 and 31 mpg, respectively, while the Outback only manages 21 mpg in the city and 28 mpg on the highway. Now, that improved fuel economy means a weaker engine, right? Wrong. Honda offers a 192-hp engine under the hood, compared to the Subaru’s potential of 173 hp. In short, Honda lets you get your money’s worth out of a new crossover, while Subaru expects drivers to pay for these features. When you add all of that in with the improved performance and engine efficiency offered by Honda, it becomes pretty clear who the victor continues to be in the crossover market. 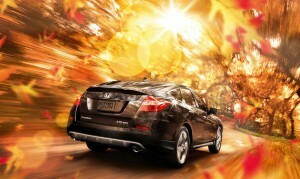 Visit our dealership and take the 2013 Honda Crosstour for a test drive. We’re confident that you’ll agree with us that it truly is one of the best crossovers on the market. Our dealership is located at 520 Route 211 East, in Middletown, which is just a short drive away for our Mechanicstown drivers. We are dedicated to your driving experience here at Middletown Honda, and we can’t wait to help you find your next vehicle. *22 city/31 highway mpg rating for 2WD 4-cylinder models. 20 city/30 highway mpg rating for 2WD V-6 models. 19 city/28 highway mpg rating for 4WD V-6 models. Based on 2013 EPA mileage ratings. Use for comparison purposes only. Your actual mileage will vary depending on how you drive and maintain your vehicle.